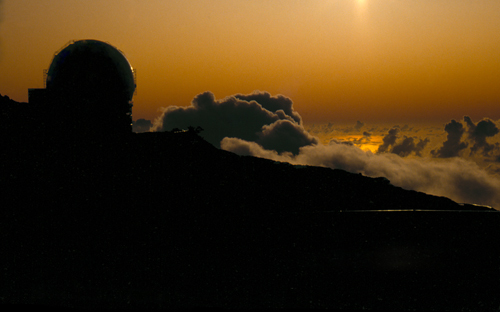 The William Herschel Telescope was for many years the biggest and best optical telescope in Europe (until GranTeCan opened in 2009). The main mirror is 4.2 m across (165″, or 13′ 9″) which astronomers call “a good light bucket”. 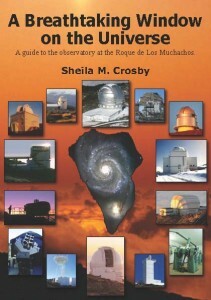 It’s rather old as world-class telescopes go, since it opened in 1987, but it still produced excellent science. In fact data from the WHT has been used for about 1,500 scientific papers. It helps that it’s been fitted with adaptive optics. This is when you use some starlight to measure the air turbulence, and then deform a special, flexible mirror to compensate for that turbulence. It’s rather like using glasses to correct for the shape of your eyeball, but these glasses change shape 100 times a second. 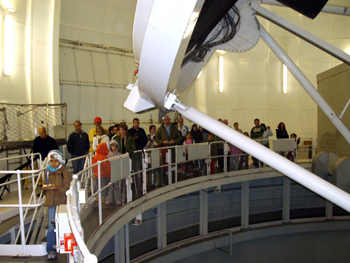 The telescope’s named after Frederick William Herschel, who was born in Germany but emigrated to England. He started life as a musician, but music lead to mathematics and then to astronomy. He’s best known for discovering the planet Uranus, but he also measured the height of the mountains on the moon, discovered double stars, catalogued loads of nebulas, found two of Saturn’s moons and two of Uranus’s moons, and was the first to realise that the solar system is moving around the galaxy. Oh, and he discovered infra-red radiation.